Jason Smart has taught drums and percussion to drummers of all ages and ability levels since 1998. His aim is to create a fun, inspirational, and informative atmosphere while working to achieve each student’s particular goals. This can range from having fun drumming with friends to being a professional musician covering a wide range of musical styles and situations. Regular areas of study can include grip, posture, rudiments, musical styles (Rock, Funk, Jazz etc. ), chart reading, time/feel studies, improvising/soloing and drum tuning/maintenance. These subjects along with any areas of interest or questions from the student are always encouraged. Jason grew up enjoying music from a very early age. While listening, learning, and enjoying his father’s and brother’s music collections, the initial spark to start drumming hit him at age 10. Jason joined his school’s concert band program in the fourth grade and practiced on a snare drum and pad that his brother had given up to play guitar. Together with his older brother, Jeremy, on guitar, Jason had fun learning musical lessons from his favorite musical groups of that time, such as The Beatles, Led Zeppelin, Rush, The Police, and many more. The brothers loved to show each other a cool new style or band that the other had found. By age 13, Jason moved to the Cincinnati area and began taking lessons with one of his band instructors, Michael Peters, at Liberty Junior School. Mr. Peters is an accomplished drummer, percussionist, and teacher who helped him with technique, rudiments, chart reading, and preparation for concert band, jazz band, and solo/ensemble contest material. While attending Lakota High School and participating in the Jazz Band there, Jason started taking lessons with another widely talented and inspirational teacher named Jacubu Griffin. With Mr. Griffin, he began studying Jazz, Latin, Funk, and Drum Corps material. These styles and discoveries helped to fuel the fire to be a professional musician later in life. After high school, Jason started teaching private drum lessons at Moeller Music in West Chester while attending University of Cincinnati’s College Conservatory of Music program majoring in Jazz/Studio Percussion. His teacher was Big Band great John Von Ohlen, who was a member of Stan Kenton’s and Woody Herman’s excellent bands as well as being a Broadway pit drummer for three years. At CCM, Jason honed his Jazz and Studio chops, gained valuable experience as a professional musician, and continued to develop new teaching methods. Jason feels blessed to have had great teachers who provided information, support, and inspiration along the way and hopes to do the same for his students. Around this time, Jason became the drummer for Ray’s Music Exchange, a popular Rock/Funk/Jazz ensemble. As a member of RME, he toured extensively, made two recordings, and garnered several Cincinnati Music Awards including “Best New Album”, 1998 (Alive Exchange) and best “Jazz Group”, 1999. 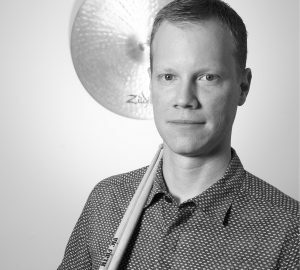 From late 2001- 2007 Jason was a member of the ground -breaking trio, Jacob Fred Jazz Odyssey, while also running a private drum studio to continue to teach lessons. During this period, JFJO released 8 recordings on Knitting Factory, Hyena, and Kufala. The band toured internationally with highlights including Berlin Jazz Fest, Tudo e Jazz Festival in Ouro Preto, Brazil, and JVC Jazz Festival in New York City. Another highlight of this time was a feature in the April 2005 issue of Modern Drummer, which was a proud moment for Jason as he had read and enjoyed the magazine growing up. Jason enjoys playing and recording a wide variety of music locally and abroad as a freelance musician as well as keeping an active teaching schedule. To date Jason has recorded nearly 40 albums with various artists. Most recently, Jason recorded a new record and is performing with his brother in Ben Knight and The Well Diggers, which is a favorite Rock/Folk/Americana band in the region.